The everyday activities of individual citizens are now the leading source of toxic chemicals flowing into Puget Sound. Many sources of contaminants have changed, although pernicious chemicals persist in the environment and continue to contaminate the food chain. The more you look, the more you find. Studies are turning up evidence of exotic chemicals in almost every environment, including remote coastal islands. Runoff from roads, parking lots, and roofs is one of the largest sources of contaminants flowing into Puget Sound. Because much of Salish Sea’s chemical contaminants stem from human activities, scientists feel strongly that by making more informed choices people can curb the problem. 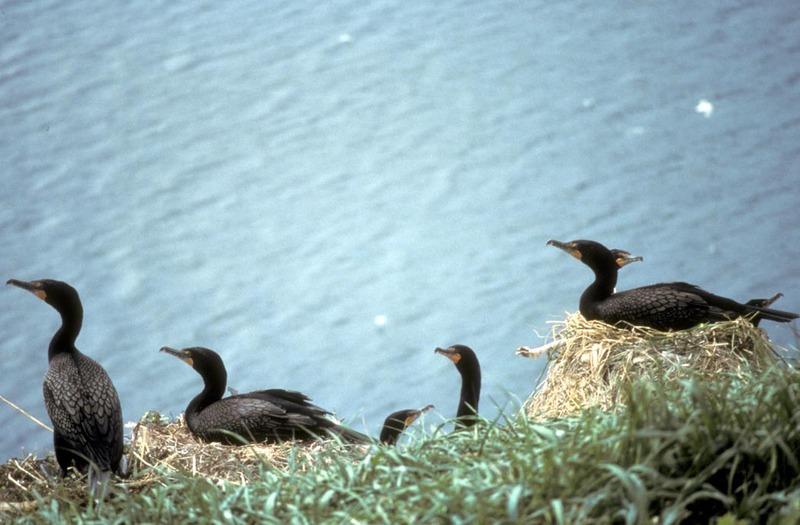 On tiny Mandarte Island in British Columbia, a group of biologists gathers for a pre-dawn raid on a population of double-crested cormorants. They will flush the birds from their nests just long enough to collect a sampling of eggs that they will take back to the lab for testing. But in this case, they are not studying the birds as much as they are documenting human behavior. The scientists are tracking the chemical signatures of modern civilization. The eggs will turn out to be carrying a slew of compounds, from flame-retardants, to commercial stain repellents like Scotchgard, and even the dwindling residue of DDT, a long-banned pesticide. Researchers are finding similar patterns across the Salish Sea, with birds like great blue herons and rhinoceros auklets. "We are seeing this in many species," says John Elliott of Environment Canada, who presented the egg studies at the 2014 Salish Sea Ecosystem Conference. Elliott has traveled throughout British Columbia, visiting remote islands by Zodiac or helicopter, climbing trees or grubbing for eggs in seabird burrows. The story is always the same. “It’s actually hard to keep track” of the growing list of chemicals showing up in research sites around the region, he says. The Salish Sea has become an alphabet soup of contaminants. The more you look, the saying goes, the more you find. Here in Puget Sound, water pollution first came to the prominent attention of the public in the 1970s and 1980s, when scientists noticed tumors developing in bottom-dwelling fish near the Duwamish River. Those tumors were caused by PCBs and other chemicals, and people were shocked to find that what they once idealized as a pristine environment—a place with sweeping views and abundant wildlife—was a de facto dumping ground. Headlines rang out calling Puget Sound a “Chemical Time Bomb” and warned residents, “don’t eat the fish.” Now, long after places like the Duwamish and the Foss waterways have become Superfund sites, the understanding of the toxic threat to Puget Sound continues to evolve. Those early industrial pollutants still remain, affecting orcas and people alike, but the number of threats has expanded. More than 30 years ago, research from a division of NOAA's Montlake Lab suddenly and irreversibly changed the way scientists and the public viewed the health of Puget Sound. Their discoveries of industrial toxics in the region's sediment-dwelling fish led to the creation of two Superfund sites, and new approaches to ecosystem management across the Sound. The man at the forefront of this research was Dr. Donald Malins. Scientists at the 2014 Salish Sea Ecosystem Conference met to discuss this trend, and while the names of the chemicals varied from talk to talk, there was one common denominator: us. The cross-border Salish Sea region includes more than 7 million people and is growing fast. By 2025 that number is expected to rise to more than 9 million. Researchers say each one of us is a source of pollution. In some cases, the vector from human to environment is clear. A recent study shows how flame retardants from couch cushions and TVs actually pass through wastewater treatment plants and into local waterways (and eventually the eggs of seabirds). In other cases, it is more mysterious. 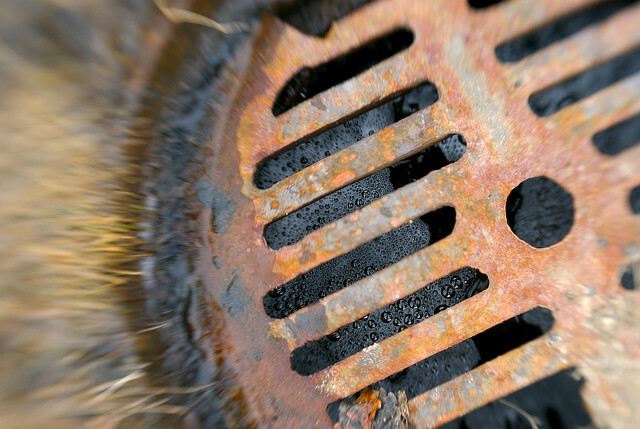 One of the region’s major sources of pollution is stormwater that flows directly from our neighborhoods and roads. Stormwater washes about 2 million pounds of toxic chemicals into Puget Sound every year, but it is not always clear what those chemicals are. Potentially thousands of different compounds flow down the drain with every rainstorm. That has created more than a few mysteries for scientists, who have been documenting the effects of runoff on wildlife. One of the most dramatic examples presented at the 2014 conference involved studies of so-called pre-spawn mortality among salmon. For the past decade, scientists have been investigating mysterious die-offs of coho salmon returning to spawn in the fall. These fish seem healthy when they enter Puget Sound streams, but within hours they become listless, disoriented, and off balance. Most fish that develop these symptoms die before they are able to spawn. So many coho are perishing in this way that scientists say many affected runs could be extinct within decades. Adult coho salmon returning to Seattle-area urban streams are dying prior to spawning, as indicated by female carcasses with nearly 100% egg retention. This example is an adult female that returned from the ocean to spawn in Longfellow Creek (West Seattle) in the fall of 2012. This condition is worse after a heavy rain, and laboratory experiments by scientists at NOAA’s Northwest Fisheries Science Center in Seattle have been unequivocal. Fish placed in baths of stormwater developed characteristic pre-spawn mortality symptoms or died within four hours. Those that spent time in well water remained healthy. In the wild, fish would rarely be exposed to such concentrated runoff, but scientists say the experiment demonstrates that runoff contains a deadly mixture. Similarly, filtering runoff through bioretention columns also prevents most of stormwater’s ill effects on small aquatic invertebrates, young coho salmon, and developing fish eggs. Completely solving Puget Sound's stormwater problem may be a distant prospect, but scientists say there is at least one silver lining. Despite the Salish Sea’s rising population, the fact that humans are the source of the pollution means that humans can also do something about it. In this sense, John Elliott finds hope in the eggs on Mandarte Island. His group's study shows that slowly but surely DDT and related chemicals are decreasing in seabird eggs. Similarly, a class of flame retardant chemicals called PBDEs increased and then decreased in seabird eggs collected between 1990 and 2010. The change occurred in concert with restrictions on the use of these chemicals. Such results sound a hopeful note that policy can make a difference, even for persistent contaminants. One wild card for researchers is a new classification of pollutants knows as emerging contaminants. These represent potentially thousands of compounds that come from industrial sources, as well as many of the pharmaceutical and personal care products that people use every day. Emerging contaminants generally occur at low concentrations in the environment and usually don’t directly kill organisms, but they may have a variety of biological effects. Many are potential endocrine disrupters, meaning they can affect hormones linked to reproduction and development. Scientists have begun to document a variety of these chemicals in Puget Sound. For example, antibiotics, antihistamines, and triclocarban, an ingredient in antibacterial soap, have been found in sediments in Seattle's Elliott Bay and elsewhere. 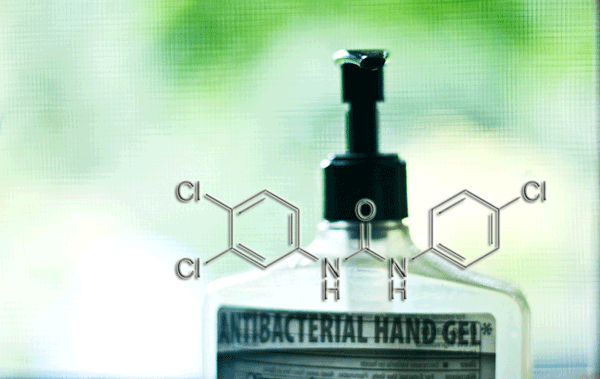 Antibacterial hand gel. Photo: trontnort (CC BY-NC 2.0) https://www.flickr.com/photos/tront/6080135069. Modified to show chemical structure of triclocarban. Exactly where emerging contaminants are found, however, and what they do remains poorly understood. For one thing, researchers say it would be overwhelmingly expensive to measure and monitor them all because there are just too many, and chemists are constantly inventing new ones. For this reason, many researchers are working to identify how exposure to the complex mixture of contaminants in water and sediments affects gene expression in aquatic species. This would provide a rapid, reliable way to measure the effect of toxics, even if scientists don’t know which specific chemicals are present in any one place, and capture how mixtures of contaminants may cause harm. Preliminary data presented at the conference by University of Washington graduate student Louisa Harding shows that young coho salmon exposed in the lab to the antidepressant fluoxetine have altered transcript levels of reproductive hormones, and that swimming in water laced with estrogen from birth control pills alters the expression of 670 genes in these fish. Other researchers are working on similar studies involving mussels, oysters, sculpin, and other species. PCBs and other toxic chemical pollutants are found throughout Puget Sound's food web at levels that may harm the species that live there. Sarah DeWeerdt is a Seattle-based freelance science writer specializing in biology, medicine, and the environment. Her work has appeared in publications including Nature, Conservation, and Nautilus.